This deciduous conifer is sometimes referred to as the fossil tree because it was once known only from fossil records! A small grove of living Metasequoias was discovered deep in China in the 1940's. Since then, it has become a favored landscape plant. This ancient tree has silky new needles that stay soft to the touch. Their fresh bright green turns to a warm golden bronze before they drop cleanly in the fall. It grows rapidly to 30-50 feet in twenty years, and may eventually be over 100 feet tall. Winter aspect is delightful, with the red-brown fibrous bark, fluted trunks and interesting branch structure. Small, ¾", cones mature the first year. 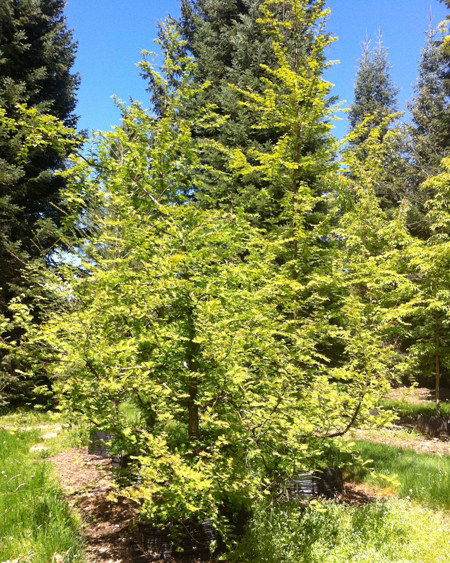 The Dawn Redwood is tolerant of wet soils; it grows in the full sun, preferring moist, deep, well-drained soil. It does well in our long growing seasons. Categories: All Plants, Conifers, Deciduous, More..